Sadly, over the years I've lost two cats to feline lower urinary tract disease (FLUTD), and our current male housecat has also had a minor run-in with this condition. Interestingly, all three cats were neutered orange tabby males, although I don't think orange cats are more prone to this problem. I've just now - today - found an herbal treatment for both felines and humans with urinary problems. Cleavers has long been recognized as a diuretic herb which cleanses the body of toxins, sending them back into the bloodstream to be cleansed by the liver and kidneys. Cleavers is used to treat bladder and kidney stones in humans. It can be used as a long-term aid in cats with FLUTD and perhaps also those with low-grade kidney infections, although I didn't find any directions for administering the herb to cats. 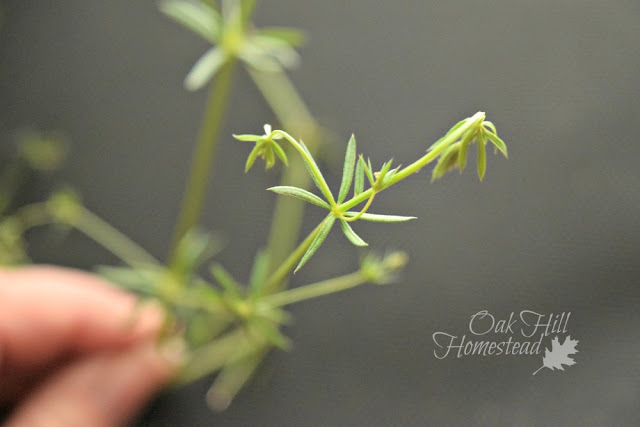 Cleavers is also said to be an appetite depressant and anti-inflammatory. Some believe it will also fight cancer by detoxifying the body. You don't have to go looking for cleavers, it will find you. 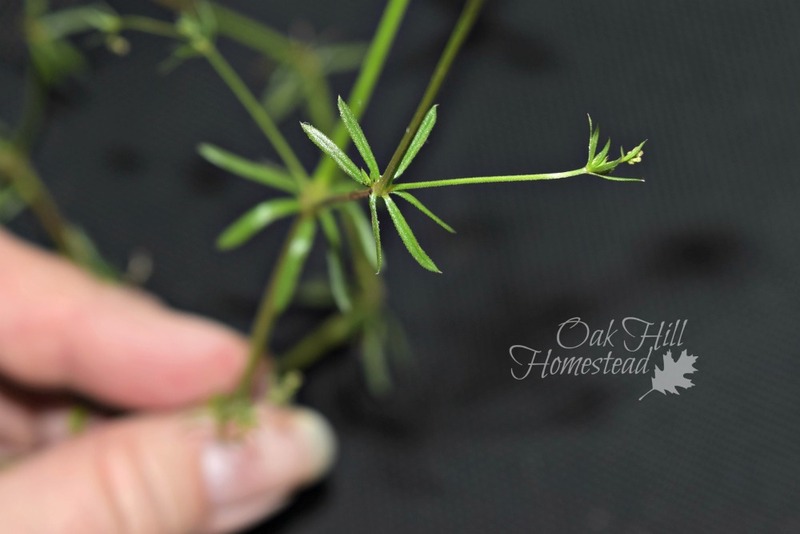 The stems are covered with tiny hooked bristles which grab onto just about anything that passes by. It will stick to your clothing, to animal fur, and to other vegetation as it grows. It is easily identifiable: if you touch the plant, it will feel "sticky". 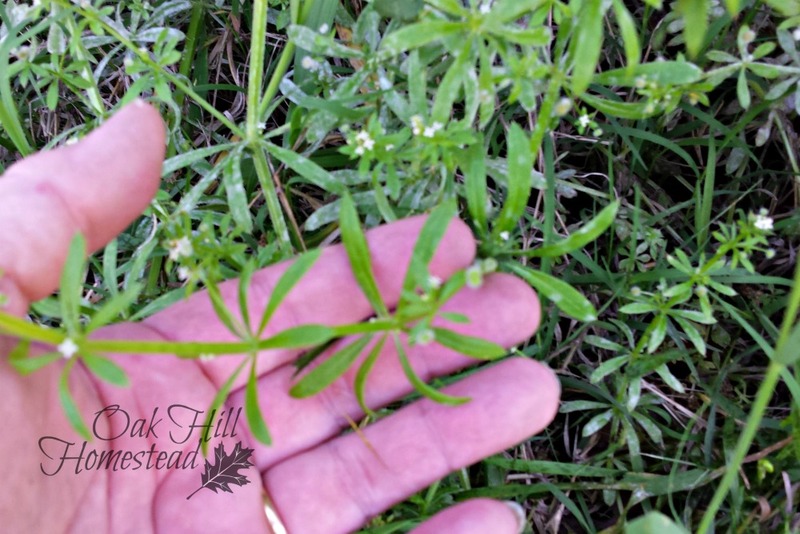 If you forage cleavers, carefully remove any debris that clings to the plant; it's much harder to clean when the plant material has dried. 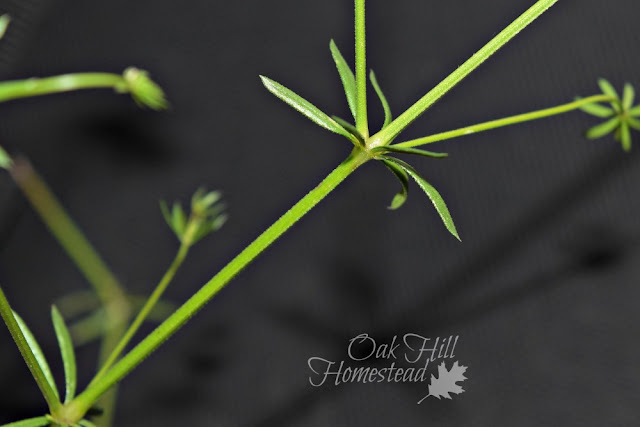 The cleavers stems are square, similar to henbit and mint. The whorled leaves are narrow and are attached to the stem in clusters of six or eight. The white flowers are quite tiny, growing in small clusters. The leaves are edible and can be eaten in salad like spinach or added to soups. The dried or roasted seeds are said to be a good substitute for coffee. To make a medicinal tea, add 3 heaping tablespoons of fresh or dried cleavers to one pint of boiling water and allow to steep for ten minutes. A mouthful should be taken several times during the day. Disclaimer: This information is provided for educational purposes only. Before using this or any herb or plant, please research it fully. You alone are responsible for your own health and that of your animals. I am not a medical professional, an herbalist, or a veterinarian. Thank you! I've had cats over the years who suffered from UTIs, the most recent is my daughter's beloved spayed female calico. I've never lost any cats to this, but have sure spent the money with the vet getting it cleared up from time to time. Will do some research to see if this plant could help solve our trouble. I'm so glad it might help, Melanie! Somehow, knowing a plant is useful makes it easier to bear and more like a friend, even if you don't use it, doesn't it? Thanks. 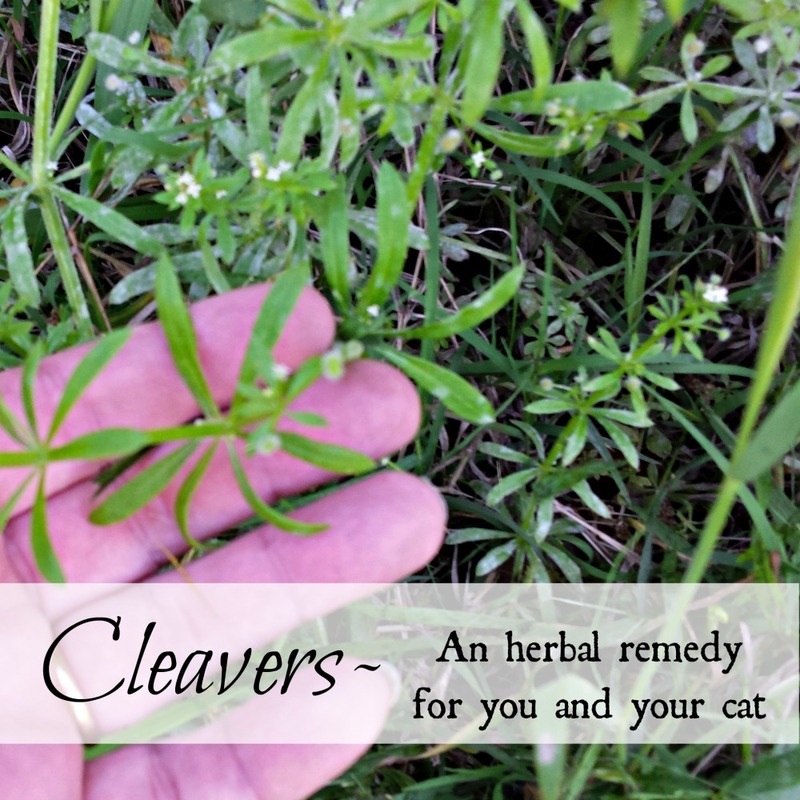 I had just found out about cleavers as a medicinal herb from watching "Victorian Pharmacy". Your blog has inspired me to pick and dry some this summer. Excellent! And thank you for passing on that resource, I'm going to go take a look at it too. Hmm... I had no idea what this obnoxious stuff was! I have it growing all over the place. I'll have to pick some and see what benefits I can get from it. We don't have cats, but I can certainly use it for myself. Thanks for sharing with us at the homestead blog hop! That's a good idea, Danielle. You are so knowledgeable about herbs and "weeds". What a great solution for cat owners! Daisy, "a weed is simply a plant that you don't know what to do with." Once I started being able to identify the "weeds" my eyes were opened! Thanks for sharing this. I'll have to research it further. Our cat suffered from a uti and had to be rushed to the vet. Poor guy. He wasn't neutered at the time. However, he was a rescue cat. My husband found him out in the snow. It was so cold that the poor cats poop was frozen to him. We had to give him a bath and cut the poo out. I don't know if his poor living conditions played a part in getting the uti or not... My fear is that he or other male cat will come down with one again. Such a dreadful thing to see. Praise the Lord our Jackson is now a healthy cat! Bless your heart for taking poor Jackson in when he needed you! I like your posts a lot as it has lot information. thanks for sharing another wonderful post to Hearth and soul blot hop. Thank you, Swathi. I hope your week will be a blessed one.